Legal actions against oil companies on effects of global warming? U.S. NRC approves restart of quake-hit North Anna nuclear plant — Smart move? NukeNe.ws is a current and comprehensive nuclear news site. As Japan’s Tsunami Debris Arrives, Can U.S. West Coast Handle It? In the coming weeks and months, a weather phenomenon known as the “fall transition” will wash the artifacts of a national tragedy onto West Coast beaches. The fall transition happens when the Northern Hemisphere storm track that governs prevailing winds sends those gusts in a completely different direction—from south to north and from offshore to inland—along with stuff that gets pushed around in the water. Right now, among the stuff that’s floating offshore is a whirlpool of junk known as the Pacific Gyre, which is estimated to hold 5 million pounds of bashed-in houses, fishing boats, docks, and dead bodies from the March 11, 2011, tsunami in Japan. The more buoyant relics of this disaster have been bobbing along for 18 months, with a few notable exceptions that have left state and federal officials scrambling to respond. When a massive dock thunked its way onto Oregon’s Agate Beach this summer, pandemonium ensued. Not only was the thing huge—at 66 feet long, 8 feet tall, and 165 tons—it was covered in gnarly invasive species, and had script in Kanji on a small plaque at the bottom. After a little sleuthing by Portland’s Japanese consulate, everyone’s worst fears were confirmed: the first piece of debris from last spring’s disaster had finally hit the continental U.S., much sooner than anyone had expected. Overnight, the “tsunami dock” became an instant tourist attraction and a headache for state parks officials, who manage the beach. They dispatched rangers in mostly futile attempts to keep rambunctious youngsters from turning the thing into a jungle gym, and they puzzled back in Salem about how to get rid of it, and how to pay for that. Two months and $85,000 later, the dock was gone. A contractor cut it into pieces using a Rube Goldberg-looking contraption whereby a diamond saw looped around and under it and sliced. This was a huge disappointment to the fans who painted a mural on the side. But it was the only option, insisted those that run the Oregon Parks and Recreation Department. You can’t just leave stuff on the beach, they said. It sets a terrible precedent. Over the next few months, Oregon and the rest of the West Coast will find that argument bolstered—by a need to keep the landing strip clear. The dock did indeed arrive early, months ahead of schedule, likely shoved faster than the currents would otherwise have carried it thanks to “windage,” an uncannily appropriate term used to describe how much of a thing is sticking out of the water, how much it creates a kind of accidental sail. The dock actually sailed across the Pacific, in other words, as much as it did float. Which is to say there’s much more tsunami debris—with less windage—still out there. Of the 5 million tons of debris estimated to have washed into the ocean after the March 2011 quake, Japanese officials say 70 percent of it sank. The rest floated. There are two more docks, just like the one the state just spent four years of college tuition to remove. There are plastic bottles, fishing floats, lightbulbs, giant chunks of Styrofoam, small appliances, mannequin parts, buoys, even entire fishing vessels. A few weeks after the dock showed up in Oregon, a 20-foot fiberglass boat covered in pelagic gooseneck barnacles up to 3 feet long washed up at Cape Disappointment State Park, in Washington. The boat was also traced to the tsunami, Curt Hart of the Washington Department of Ecology told The Daily Beast. After determining that the owner “didn’t want it back,” the state checked it for radiation (all clear), blasted it clean and tossed it in a landfill. Marine debris is not a new phenomenon. Litterbugs and careless ship crewmen and leaking landfills have conspired for decades to clog the world’s oceans with all sorts of junk, creating loosely affiliated “garbage patches” in certain gyres with clockwise, rotating currents that have a way of concentrating marine debris. That problem is the raison d’être for The 5 Gyres Institute, a Los Angeles-based nonprofit whose founders have spent much of the past three years sailing the world’s oceans with a “Manta Trawl” attached to the side of the boat, scooping up samples of trash so as to generate estimates of how much more is out there. It’s frustrating for 5 Gyres’ policy coordinator Stiv Wilson to be reminded that people don’t seem to know how rubbish-laden the planet’s waterways actually are. “All these images, such stunning images when the tsunami first happened, the same pictures exist of what a river in Jakarta looks like every day,” he told The Daily Beast. The operator of the stricken Fukushima nuclear plant has been dumping something like a thousand tons per day of radioactive water into the Pacific ocean. Remember, the reactors are “riddled with meltdown holes”, building 4 – with more radiation than all nuclear bombs ever dropped or tested – is missing entire walls, and building 3 is a pile of rubble. The whole complex is leaking like a sieve, and the rivers of water pumped into the reactors every day are just pouring into the ocean (with only a slight delay). Most people assume that the ocean will dilute the radiation from Fukushima enough that any radiation reaching the West Coast of the U.S. will be low. Scientists have stated that radiation in the ocean very quickly becomes diluted and would not be a problem beyond the coast of Japan. U.S. fisheries are unlikely to be affected because radioactive material that enters the marine environment would be greatly diluted before reaching U.S. fishing grounds. “The Kuroshio current is considered like the Gulf Stream of the Pacific, a very large current that can rapidly carry the radioactivity into the interior” of the ocean, Buesseler said. But – just as we noted 2 days after the earthquake hit that the jet stream might carry radiation to the U.S. by wind – we are now warning that ocean currents might carry more radiation to the at least some portions of the West Coast of North America than is assumed. 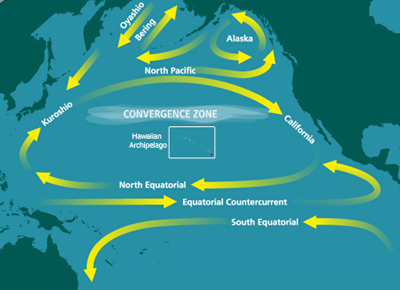 The ocean currents head from Japan to the West Coast of the U.S. The floating debris will likely be carried by currents off of Japan toward Washington, Oregon and California before turning toward Hawaii and back again toward Asia, circulating in what is known as the North Pacific gyre, said Curt Ebbesmeyer, a Seattle oceanographer who has spent decades tracking flotsam. “All this debris will find a way to reach the West coast or stop in the Great Pacific Garbage Patch,” a swirling mass of concentrated marine litter in the Pacific Ocean, said Luca Centurioni, a researcher at Scripps Institution of Oceanography, UC San Diego. The debris mass, which appears as an island from the air, contains cars, trucks, tractors, boats and entire houses floating in the current heading toward the U.S. and Canada, according to ABC News. The bulk of the debris will likely not be radioactive, as it was presumably washed out to sea during the initial tsunami – before much radioactivity had leaked. But this shows the power of the currents from Japan to the West Coast. Indeed, an island of Japanese debris the size of California is hitting the West Coast of North America … and some of it is radioactive. In addition to radioactive debris, MIT says that seawater which is itself radioactive may begin hitting the West Coast within 5 years. Given that the debris is hitting faster than predicted, it is possible that the radioactive seawater will as well. Because of the huge amounts of radioactive water Tepco is dumping into the Pacific Ocean, and the fact that the current pushes water from Japan to the West Coast of North America, at least some of these radioactive “streams” or “hot spots” will likely end up impacting the West Coast. EVERYBODY who gets cancer in Japan over the next 40 years will no doubt blame their misfortune on radiation from Fukushima Daiichi. This will probably be the case for many other diseases too, ranging from heart failure to nose bleeds – as happened after the catastrophic explosion in 1986 at Chernobyl, a Soviet nuclear power station in Ukraine. This would be entirely understandable but will have no basis in science. On 12 April 2011, a month after the tsunami struck, Japan’s Nuclear and Industrial Safety Agency announced that it was raising the grading of the Fukushima Daiichi event from 5 to 7 – the highest level on the International Nuclear and Radiological Event Scale (INES). This helped to create the misleading impression that the event was as bad as Chernobyl, and has since been exploited in anti-nuclear propaganda despite the fact that there is no possibility that the physical health consequences of Fukushima Daiichi will be anywhere near as bad as those of Chernobyl. As far as anyone knows, no member of the public received a significant dose of radiation attributable to the Fukushima Daiichi reactor emergency and no physical health effects of radiation should be expected. The INES, introduced by the International Atomic Energy Agency in 1990, rates nuclear incidents and accidents on a scale that runs from 0 to 7. It is based on off-site and on-site effects, and on the degradation of the nuclear plant’s “defence in depth”. Before Fukushima Daiichi, only one accident – Chernobyl – had been rated level 7. Chernobyl was the worst that could happen. Safety and protection systems failed and there was a full core meltdown in a reactor that had no containment. In the “defence in depth” of nuclear power plants outside the former USSR, containment is an essential engineered safety feature. The figures tell a story: 237 Chernobyl workers were taken to hospital with suspected acute radiation sickness; 134 of these cases were confirmed; 28 were fatal; about 20 other workers have since died from illnesses considered to have been caused or aggravated by radiation exposure; two workers died from other causes at the time of the accident and another disappeared – presumed dead. On top of that, it has been estimated that about 4000 people will die (or may already have died) from radiation-induced cancer, including workers exposed directly to radiation, and members of the public exposed to the huge release of radioactive material from the reactor. About 4000 cases of thyroid cancer, which typically kills about 5 per cent of people who get it, have been attributed to inhalation and ingestion of radioactive iodine by children. At Fukushima Daiichi, the reactors shut down safely when struck by the magnitude-9 Tohoku earthquake, the fourth largest ever recorded. But problems arose after they were inundated by a much larger tsunami than had been anticipated when the nuclear plant was designed. This caused the loss of all power on the site so that cooling systems failed and some of the reactor cores overheated. Radioactive fission products were released and hydrogen was generated by chemical reaction. The reactor containments were partially effective, although they were damaged by hydrogen explosions and possibly by molten fuel. Again, the casualty figures tell their own story. Severe potential hazards did exist on the reactor sites because of high levels of radiation, but health controls were mainly effective. There were no deaths attributable to radiation. Two workers received burns from beta radiation. They were discharged from hospital after two days. Two workers incurred high internal radiation exposure from inhaling iodine-131, which gives them a significant risk of developing thyroid cancer. Doses incurred by about 100 other workers have been high enough to cause a small risk of developing cancer after 20 or more years. But the risk is very small indeed. About 25 per cent of the population dies from cancer whether accidentally exposed to radiation or not. This rate might be increased by an additional one or two per cent among the exposed workers. What is more, exposures to radiation were nowhere near high enough to cause acute radiation sickness. Importantly, there have been no radiation injuries to children or to other members of the public. The INES was intended to aid public understanding of nuclear safety. In fact, it has caused more confusion. It has also probably added to the mental anguish of the Japanese people. The accident at Fukushima Daiichi was moved to the top of the scale a month after the tsunami for technical reasons, when the estimate of radioactive material released exceeded the International Atomic Energy Agency’s criterion for level 7. However, the amount of iodine-131 escaping from all the reactors at Fukushima Daiichi was less than 10 per cent of the amount released at Chernobyl, and the release of caesium-137, the next most important fission product, was less than 15 per cent of the Chernobyl total. Unless it is to be scrapped entirely, the INES should be substantially modified. One possibility is to divide level 7 into several sub-levels. But perhaps a better option might be to start again. A scale based on health effects would mean a lot more to non-specialists than the technical and scientific terminology that is used at present. Cover up of Japan Fukushima Nuclear Radiation Fallout Forecasts Exposed! I previously reported on the steady concentrated stream of Nuclear radioactive fallout heading toward the US and Canada. In that post I pointed out that several censored radiation forecasts have been found but were never released to the public. We now have for the first time a side by side comparison of two radiation fallout forecasts. On the left is the censored version released to the public downplaying the levels of radiation spreading around the world. On the right is the same uncensored forecast. If you have doubt that the censored version is the real forecast then consider this: Notice the censored version doesn’t show radiation hitting Europe. Now checkout this article from the Independent reporting that the nuclear fallout has hit Europe. A plume from the Fukushima Dai-ichi complex carrying trace amounts of radioactive iodine has been detected in Iceland, the country’s Radiation Safety Authority said. However, it added, the concentration was “less than a millionth” of what was found in European countries in the wake of the 1986 Chernobyl disaster that spewed radiation over a large distance. Recollections of the accident’s aftermath continue to haunt many in European, putting them on edge as they watch the Japanese nuclear crisis unfold. “We thus conclude that there is no reason to worry about radioactivity levels in Iceland, nor anywhere in Europe, resulting from the nuclear accident in Japan,” said Sigurdur Emil Palsson, head of emergency planning. Elsewhere, French authorities said very weakly contaminated air is expected to reach France today while Germany’s Federal Office for Radiation Protection said if and when radiation arrived it would be in marginal amounts that would pose neither a risk to humans or the environment. “The measurements will also be much lower that those after the Chernobyl disaster,” it said. This site was sent to me, and it clearly shows the hidden (not shown to public) forecasts! In these shots, we see VERY high levels of Cesium-137 making its way across the pacific to the USA and Canada. They were the nuclear guinea pigs of the Cold War. 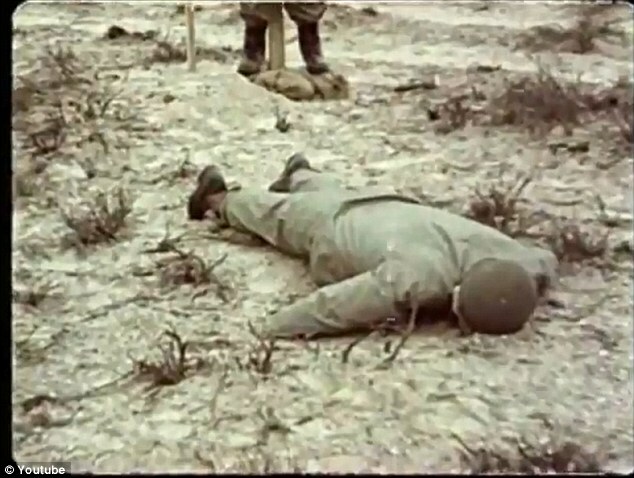 And this is the shocking film to show how U.S. Marines were used in hundreds of experiments by the US military to test the limits of nuclear bombs between 1951 and 1957. During many of those tests, soldiers who thought of themselves as ‘ground grunts’ and were sworn to secrecy witnessed the atomic explosions first-hand, and from close range, before the devastating health risks of those bombs were fully understood. 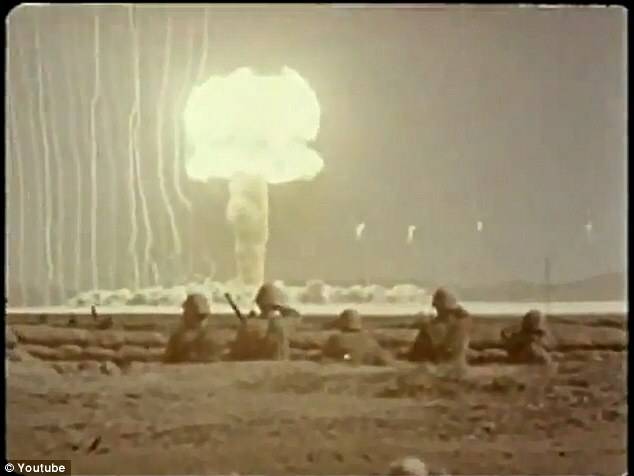 In Operation Desert Rock, the military conducted a series of nuclear tests in the Nevada Proving Grounds between 1951 and 1957, exposing thousands of participants – both military and civilian – to high levels of radiation. Though roughly half of those veterans were survivors of World War II, serving at Hiroshima and Nagasaki, Japan, the rest were exposed to nuclear grounds tests which lasted until 1962. In an article published last October, the Bangor Daily News, the paper notes that the government wished to keep the tests out of the public eye. As a result, the plight of these soldiers exposed to high levels of radiation, suffering from radiation sickness, nausea, and cancers. Many of their children were born with deformities. Former Marine James D. Tyler was one such soldier present at a bomb testing in 1957. He was told by his commanding officer to stand in six-foot ditch with fellow troops, keeping his head tucked under his arm, eyes closed. He was 18 at the time, and participated with some 14,000 others in Operation Plumbbob. That operation consisted of 29 separate explosions as the military tested various types of warheads, in a move that is still controversial today. Mr Tyler recounted his experience to the Daily News, and said that he was one of the lucky ones who didn’t show radiation symptoms. The paper reports Mr Tyler has been in a bitter bureaucratic dispute with the Veteran’s Association to receive financial help for joint issues. Operation Plumbbob released some 58,300 kilocuries of radioiodine into the atmosphere, large enough to produce thousands of cases of thyroid cancer and leukemia. Another operation – called Operation Cue – sought to test how objects like buildings, food, clothing, and people, responded to nuclear explosions. After the bomb deployed, soldiers would simulate operations like delivering food to victims of the attack and medically tending to them. The fallout from that bomb reached 1,000 miles. The health risks associated with radiation exposure, whether it comes from cancer treatments or medical imaging scans, are much more significant than most people probably think. The latest published data on radiation exposure suggests that roughly 25,000 Americans develop cancer every year as a result of medical radiation exposure, and many more experience DNA damage that could eventually lead to the development of cancer and other health problems in the long term. A smartphone or a teddy bear for the baby? According to a study involving 1,650 mothers living in the UK, almost 30 percent of the moms surveyed chose a smartphone over milk or some other common form of comfort for their crying, restless, or unoccupied child. This choice of distraction can be viewed as the beginning of a lifetime of exposure to electromagnetic fields (EMFs) and possibly the initiation of electromagnetic field intolerance. Also known as electromagnetic hypersensitivity (EHS), this condition is associated with long-term contact with low levels of EMFs emitted from a myriad of electrical devices. “That amount of radium found to date cannot be explained by gauges, deck markers, and decontamination activities,” wrote Stephen Woods, an environmental cleanup manager at the California Department of Public Health. Besides the fact that they are being operated by an agency that demonstrates on a daily basis a disdain and disregard for discretion, privacy, and professionalism, the Transportation Security Administration’s full-body backscatter x-ray machines are just not safe. A company charged with decontaminating the devastated Fukushima Nuclear Power Plant encouraged its workers to falsely lower their radiation dosimeter readings by covering the devices with lead, according to a leaked tape of an internal meeting. Most people who know about the disaster at the Fukushima Daiichi nuclear power complex on Japan’s east coast believe it was caused by a natural disaster: A huge, earthquake-generated a tsunami that swept over and through the complex in March 2011, heavily damaging three of its reactors in the process, leaving radiation-contaminated earth and sea in its wake. Japan’s Fukushima nuclear crisis was a preventable disaster resulting from “collusion” among the government, regulators and the plant operator, an expert panel said on Thursday, wrapping up an inquiry into the worst nuclear accident in 25 years. TEPCO (Tokyo Electric Power Co.), the owners of the Fukushima plant, reported that the lethal levels — 10,300 millisieverts an hour — were 10 times higher than the levels at Fukushima’s numbers two and three reactors. “Workers cannot enter the site and we must use robots for the demolition,” said TEPCO. As the fallout – no pun intended – from Japan’s tsunami-damaged nuclear reactors at its Fukushima complex continues to worsen, scientists are now concerned about another related phenomenon that appears to be invading the U.S. West Coast – buckyballs. People have been misinformed about the tragedy at Fukushima and its consequences. There is a continuing cover up, the reactors have not been stabilized, and radiation continues to be released. The Japanese College of Intravenous Therapy (JCIT) has recently released a video for people wishing to learn more about how to protect themselves from contamination by taking large doses of vitamin C.
The news you are about to read puts everything else in the category of “insignificant” by comparison. Concerned about the 2012 U.S. presidential election? Worried about GMOs? Fluoride? Vaccines? Secret prisons? None of that even matters if we don’t solve the problem of Fukushima reactor No. 4, which is on the verge of a catastrophic failure that could unleash enough radiation to end human civilization on our planet. During a recent Congressional delegation trip to Japan, Oregon Senator Ron Wyden witnessed with his own eyes the horrific aftermath of the Fukushima Daiichi nuclear disaster, which we have heard very little about from the media in recent months. The damage situation was apparently so severe, according to his account, that he has now written a letter to Ichiro Fujisaki, Ambassador of Japan, petitioning for more to be done, and offering any additional support and assistance that might help contain and resolve the situation as quickly as possible. The crisis in Japan has also brought into the open the unspoken relationship between nuclear energy and nuclear war. Nuclear energy is not a civilian economic activity. It is an appendage of the nuclear weapons industry which is controlled by the so-called defense contractors. The powerful corporate interests behind nuclear energy and nuclear weapons overlap. Cell phones emit a dangerous non-ionizing form of electromagnetic radiation; radiation which can be absorbed by the tissues and cells which come into close contact with the phone, e.g., the head and neck. Scientific studies in the past have produced conflicting results; however, more recent studies working with long term exposure, (ten years or more), have clearly established that a link between cell phone use and certain forms of cancer exists. During the nuclear catastrophe at the Fukushima Daiichi nuclear power plant in Japan’s northeast last March, the world watched in horror as conditions in the plant deteriorated by the day. Despite public reassurances that the situation was under control, we now know that three of the plant’s reactors actually began meltdown within hours and that plans were being made at the highest levels of the Japanese government to evacuate Tokyo, the world’s most populous metropolitan area. In effect, the world was given a crash course in cascading nuclear failure. What many do not know is that the damaged reactors were designed by General Electric, rely on 40-year-old containment technology, and are substantially similar to 32 reactors currently operating around the world, including 23 in the United States. Areas with 10,000 Bq/m² of radioactivity considered “highly contaminated” by study — Over 30,000 square kilometers in Japan exceed level, 8% of nation. The Dual Ridge Metal Boutique tissue boxes sold at Bed, Bath & Beyond stores have been discovered to be radioactive. Made with the extremely dangerous material used to blast cancer tumors with radiation — cobalt-60 — they emit gamma rays that are known to cause both cancer and infertility. They were manufactured in India, shipped on a commercial container to New Jersey, and then distributed to Bed, Bath & Beyond stores in 20 states. No matter how many times the US Transportation Security Administration (TSA) claims the machines are safe and pose no threat to travelers or personnel, naked body scanners that emit ionizing radiation are, indeed, a very serious health threat. And Dr. Edward Dauer, head of radiology at Florida Medical Center, agrees, having recently come forward to explain that naked body scanners can cause cancer, particularly in those over age 65 and in women who are said to be genetically prone to developing breast cancer. Things are suddenly heating up again with Fukushima. As we reported yesterday, the southern wall of Fukushima reactor #4 apparently collapsed over the past few days, calling into question the structural integrity of the remainder of the containment building. The mainstream media has said absolutely nothing about this development, continuing its pattern of downplaying news involving Fukushima, radiation or the flawed structure of nuclear power plants. This is hardly surprising, given that many of the largest media outlets (such as NBC and MSNBC) are owned by corporations such as General Electric, the designer of many of the world’s nuclear power plants. The woes of Fukushima are far from over as the plant’s owner, the Tokyo Electric Power Company (TEPCO), announced recently that a purification mechanism has leaked at least 45 tons of highly radioactive water, some of which ended up flowing directly into the ocean. TEPCO officials are reportedly in the process of investigating the situation to determine the extent of the damage caused. Many people are aware that prolonged cell phone use has been associated with brain cancer, but most don’t realize how other sources of high-frequency electromagnetic radiation (EMR) also radically increase cancer risk. In Northeast Arizona the Navajo nation is living on contaminated land. The land was once full or uranium ore and in the 1940’s the Navajo natives were employed by the US government to mine the Uranium ore. But since then the Navajo have been suffering severe health issues from the contamination of the elevated levels of radiation. During court proceedings concerning a radioactive golf course, Tokyo Electric Power Co. stunned lawyers by saying the utility was not responsible for decontamination because it no longer “owned” the radioactive substances. “Radioactive materials (such as cesium) that scattered and fell from the Fukushima No. 1 nuclear plant belong to individual landowners there, not TEPCO,” the utility said. The nuclear disaster is ongoing. At present, I believe that there is a possibility that massive amounts of radioactive materials will be released into the environment again. Electromagnetic fields, or EMFs, are emitted by all electronic devices. This means that EMFs are in your home, in your office, and even outside! Unfortunately, few people are aware of the dangers of overexposure to EMFs and even fewer know how to prevent it. EMF filters are a great way to keep your home safe and reduce the EMF exposure of your family. The debate surrounding the relative dangers of electromagnetic radiation has raged on for years. As technology has become more and more advanced, and more electromagnetic fields, or EMFs, are created, the fact that electromagnetic radiation can be harmful cannot be ignored. Wireless routers, one of the most convenient products in homes across the world, can actually contribute high levels of EMF exposure to your home. Electromagnetic fields, or EMFs, are areas of energy that form around all electrical appliances and devices. Your body is sensitive to electricity (some if its functions actually rely upon electric current), so it is understandable how you can be affected by the EMFs radiated by cells phones, microwaves, televisions, and other electrical devices. But is there one product that is worse than the others? One everyday item you may use that could be hurting your body? Yes. Research has indicated that cordless phones can be up to one hundred times more dangerous than their mobile counterparts! The silence of governments and the world press about the radiation dangers from Fukushima is alarming to say the least. We have an open nuclear sore on the planet, a radioactive boil that continues to burst casting a toxic shadow on the people of Japan and a few other billion people who happen to live in the northern hemisphere. In the aftermath of the Fukushima Daiichi nuclear disaster, some countries have decided to rethink their energy policies and initiate moves towards safer energy alternatives. Following in the footsteps of Germany, the European nation of Belgium has reportedly decided to phase out its nuclear energy sector, beginning with the shutdown of three of its oldest reactors by 2015. Few in the mainstream media are talking about it these days, but radiation from the Fukushima Daiichi nuclear disaster is still spewing into and contaminating the environment. And a professional engineer from Worcester Polytechnic Institute’s (WPI) Department of Civil & Environmental Engineering says that levels of radioactive cesium in US topsoil have recently been detected at levels up to 10,000 percent higher than previous studies have found. On Sept. 23, 1998, a panel of radiation safety experts gathered at a Hilton hotel in Maryland to evaluate a new device that could detect hidden weapons and contraband. The machine, known as the Secure 1000, beamed X-rays at people to see underneath their clothing. With worries about the safety of nuclear energy on the rise worldwide, word comes from workers at an Ohio nuclear power electric utility plant [Davis-Besse] that a giant crack has appeared in the facility’s containment building. When nuclear energy production technology first began to emerge in the US in the 1950s, neither scientists nor the US government considered what would be done with nuclear reactors once it was time for them to be put out of commission. And recently-released documents reveal that, in an effort to hastily deal with this problem after the fact, the US government actually tried to conspire with Japan to gain secret approval for dumping decommissioned nuclear reactors into the world’s oceans. It resembles the plot line of a cheesy horror flick, but the idea that a new generation of vicious “mutant” dogs will one day spawn from puppies still living in and around the Fukushima Daiichi nuclear disaster zone is something that Japanese officials are taking very seriously. According to a recent report in The Seattle Times (ST), efforts aimed at capturing the hundreds of wild dogs still living in the Fukushima no-entry zone are failing, and many of the dogs are growing ever more wild as they freely scour the human-less fallout zone. At least one billion becquerels a day of radiation continue to leak from Japan’s Fukushima nuclear plant after the March earthquake and tsunami. Experts say that the total amount of radiation leaked will exceed amounts released from Chernobyl, making Fukushima the worst nuclear disaster in history. The United States could only account for 1,160 out of 17,500 kilograms of Highly-Enriched Uranium (HEU) — weapon-usable nuclear material — exported to 27 countries in response to a 1992 congressional mandate, according to a Government Accountability Office (GAO) report released last week. Exposing the “unspeakable” realities of the Japanese catastrophe in this 60 Minutes program Sunday night during which leading nuclear scientist Dr. Michio Kaku said radiation from Fukushima will impact of all of humanity. The nuclear energy power industry violation of the right to health is apparent throughout the new Australian report. “In fact the whole world will be exposed from the radiation from Fukushima,” Dr. Kaku told reporter Liz Hayes. There has been a lot of disinformation regarding the Fukushima Nuclear disaster. It appears the government agencies of other nations cooperated with Japan while the international nuclear industry sided with TEPCO’s (Tokyo Electric Power Company) disinformation and denial campaign. Nothing good about the nuclear news at the end of August as we have official recognition (finally) of what is going on in Japan and thus what is threatening the rest of the world, especially the northern hemisphere. It is now being said that the amount of radioactive cesium that has leaked from a tsunami-hit nuclear plant is about equal to 168 of the atomic bombs dropped on Hiroshima at the end of World War II, Japan’s nuclear agency said Friday the 26th. Time is running out for the 35 million people in the Tokyo metropolitan area and, in fact, in a year or two all of northern Japan will become quite uninhabitable for there is no way for them to stop the process once the fissioning materials work their way down into the earth and the water table below, which they have already done. TV station KHOU of Texas, reported a cover up conspiracy regarding radioactive levels in Texas drinking water in May 2011. The cover up efforts were known as high as the Texas governor Rick Perry’s office and allowed to continue. In a small way, this reflects what’s been happening with the Fukushima radioactivity reports that affect the world. An independent radiation test in Toronto Canada has revealed startling levels of radiation just days after famed nuclear expert Arnie Gundersen claimed that radioactive rain would continue to hit the west coast for upwards of a year. Five months ago today, the nuclear crisis began in Fukushima, and the government began lying about the threat and the dangers to its people. Now they are beginning to build a gigantic tent over reactor number one. We do not have any information from Japan about people dying but the plants are dying in the middle of central Tokyo and it could be because of the increase in radiation. One irony of the radioactive fallout from Fukushima is that people in Japan are starting to pay more attention to nature. A Major Canadian Paper Reports That The Government Covered Up Massive Amounts Of Radioactive Material From Fukushima In Canadian Air” And Are Continuing To Manipulate Radiation Monitoring Data. Remember all those idiots who claimed that Fukushima is contained, or better yet, the drama is exaggerated? Perhaps it is time to exile them all, starting with that moron from MIT, to Fukushima where the radiation measured at the base of the main ventilation stack just hit an all time high 10 sieverts/hour. The truth likely is much uglier: this is simply the highest reading the devices are able to record. In other words, there does not exist a device that can capture the true extent of the catastrophe at Fukushima! TSA rolled out the scanners on the sly. The majority of the flying and non-flying public, including airline employees, had no clue what was going on. Many passengers went through the scanners without knowing what they were. Scientists at government-run (NIST) or government-contracted (JHU-APL) labs were given limited access to the technology and were also given a limited scope of research. This research did not include an assessment of safety. Nonetheless, the TSA repeatedly claimed these scientists had shown the scanners were safe, and, in the past year-and-a-half, they have not made the machines available to independent scientists or addressed the major concerns that have been brought up by “independent” (or at least, critical) scientists. The only additional data to come out has not been peer-reviewed and still does not address the primary questions that are necessary to assess the safety of these machines. I have no reason to expect the collectivist mentality that leads to concerns about public security would even remotely consider individual rights. But, if the naked scanners are being used in the name of “public security,” then why is the matter of “public safety” being treated so cavalierly? The answer is that these machines are not in place to protect you or me, or even all Americans. They are in place to protect the state and its bureaucrats. What happened in Fukushima, Japan on March 11, 2011 may be the most sinister global disaster in the recorded history of our planet. The repercussions of this historic disaster will remain for centuries to come. The manifestations of nuclear radiation from the meltdown of the reactors in Fukushima will haunt humanity in ways that we’ll only discover over time. The obvious poisoning of our food, water, and air is just the beginning of what is happening to humanity, animal and plant life, and the planet. For almost three months the bad nuclear news has been shouting at us, warning us, but even the professionals in the area of toxicity are not abandoning their lives or homes. Is it an everyone-goes-down-with-the-ship paradigm that has a hold on these people? The invisible but hot magna of nuclear toxicity is our latest inheritance and few will escape it though there are many things we can do to diminish radiations nasty effects. Fort Calhoun is a nuclear facility near Omaha, Nebraska. Why should you know about Fort Calhoun? It is currently in a state of near meltdown, but the mass media decided to put a blackout on the subject. There was an official story that there was a fire in an electrical switchgear room at the plant. The fire resulted in the loss of power to a pump that cools the spent fuel rod pool, allegedly for about 90 minutes. Even if power was only lost for 90 minutes a full nuclear meltdown was extremely possible, and in such a populated area a breaking news report should have been made. The announcement comes on the heels of several others involving US nuclear plants, including the potentially ill-fated Fort Calhoun Nuclear facility near Omaha, Neb. and the Los Alamos National Laboratory that was threatened by wildfires last week. In the NC case, reports do not indicate why radioactive cooling water is leaking from the facility, but its operators insist, just like the experts associated with the other nuclear plants are doing, that everything is just fine. Threats of radioactive disaster from what is shaping up to be the largest wildfire in the state’s history are escalating, as heavy winds and plenty of dry brush have fueled flames to within 50 feet of New Mexico’s Los Alamos National Laboratory (LANL), home of the first atomic bomb. Crews claim there are currently no fires burning on the lab’s 36 square mile property, but the entire town of Los Alamos, population 11,000, has been evacuated, and the US Environmental Protection Agency (EPA) is now on radiation alert in the area. What in the world is really going on at Los Alamos, Ft. Calhoun and Fukushima? There are millions of Americans that would like the truth about what is happening at these nuclear facilities, but the mainstream media has been strangely quiet. Instead, the mainstream media is running headlines such as “10 Dirtiest U.S. Beaches Named” and “Pole Dance Stops Times Square Cold”. Yes, those are actually headlines that appeared on the front pages of major mainstream news websites in the United States today. Sadly, you really have to dig to find anything about the problems that are currently happening at nuclear facilities in the United States, and the mainstream media seems to have gotten really tired of talking about Fukushima. It is almost as if the mainstream media actually prefers to talk about mindless things rather than focus on the truly important events that are happening all around us. Doctors from Watari Hospital in Fukushima, Japan, recently conducted tests on residents living in two Japanese towns located about 25 miles from the crippled Fukushima Daiichi nuclear power facility, and discovered that all of them had radioactive particles in their urine. This shocking discovery reveals just how widespread the nuclear catastrophe really is, and how its devastating implications will likely continue to persist indefinitely. The Fort Calhoun Nuclear Station turned to diesel-powered generators Sunday after disconnecting from the main grid because of rising floodwaters. That move came after water surrounded several buildings when a water-filled floodwall collapsed. The plant, about 19 miles north of Omaha, remains safe, Omaha Public Power District officials said Sunday afternoon. Sunday’s event offers even more evidence that the relentlessly rising Missouri River is testing the flood worthiness of an American nuclear power plant like never before. The now-idle plant has become an island. And unlike other plants in the past, Fort Calhoun faces months of flooding. Looking at the current Japanese meltdown as more than 50 Chernobyls is one way some people are beginning to estimate the disaster. Simple division tells us there are at least 48.6 Chernobyls in the burning old reactor cores pumping fiery isotopes into the Earth’s atmosphere. Some are calculating that this all adds up to three thousand billion (3,000,000,000,000) Lethal Doses of Radiation ~ meaning there are 429 Lethal Doses chasing each and every one of us on the planet, to put it in a nutshell. Two U.S. nuclear electricity facilities, the Fort Calhoun and Cooper nuclear plants in Nebraska, are facing the threat of rising flood waters from the Missouri river. Though safety regulators insist the plants were designed to withstand flooding and no risk of disaster exists, the Federal Aviation Administration (FAA) has been enforcing a no-fly zone over the Fort Calhoun plant since early this month, even though the plant has been shut down since early April for refueling. Last week, NaturalNews reported that rising Missouri River flood waters prompted officials to declare a “Notification of Unusual Event” as the Fort Calhoun Nuclear plant just outside of Omaha, Neb. (http://www.naturalnews.com/032672_n&#8230;). Since that time, flood waters have continued to rise, the US Federal Aviation Administration (FAA) has declared a mysterious two-mile radius “no-fly” zone around the plant for unknown reasons, and federal officials continue to claim in spite of all this that plant is just fine. “Fukushima is the biggest industrial catastrophe in the history of mankind,” Arnold Gundersen, a former nuclear industry senior vice president, told Al Jazeera. Japan’s 9.0 earthquake on March 11 caused a massive tsunami that crippled the cooling systems at the Tokyo Electric Power Company’s (TEPCO) nuclear plant in Fukushima, Japan. It also led to hydrogen explosions and reactor meltdowns that forced evacuations of those living within a 20km radius of the plant. Gundersen, a licensed reactor operator with 39 years of nuclear power engineering experience, managing and coordinating projects at 70 nuclear power plants around the US, says the Fukushima nuclear plant likely has more exposed reactor cores than commonly believed. “On June 6, 2011, the Fort Calhoun pressurized water nuclear reactor 20 miles north of Omaha, Nebraska entered emergency status due to imminent flooding from the Missouri River. A day later, there was an electrical fire requiring plant evacuation. What we have not heard from the EPA, AMA, CDC, NIH and, even less, from ‘your doctor’ or ‘medical experts’ on major TV networks, is that there is a good alternative that does exist under the circumstances. The main reason for the silence engulfing this alternative is not only because of its belonging to alternative medicine but, also, because it represents its most strange and even irrational category. Its name is homeopathy. The list that reflects its seemingly irrational nature, at least for allopathically or pharmaceutically-conditioned minds, is quite impressive, indeed. It is nothing short of astonishing that the nuclear catastrophe we’ve all been told was “no big deal” has now escalated into the worst nuclear disaster in the history of human civilization. It’s so bad now that soil samples taken from outside the 12-mile exclusion zone (the zone considered safe enough by the Japanese government for schoolchildren to attend school there) are higher than the 1.48 million becquerels a square meter limit that triggered evacuations outside Chernobyl in 1986. In other words, the radiation level of the soil 12 miles from Fukushima is now higher than the levels considered too dangerous to live in near Chernobyl. This is all coming out in a new research report authored by Tomio Kawata, a fellow at the Nuclear Waste Management Organization of Japan. That same report also reveals that radiation from Fukushima has spread over 230 square miles. The long term effects of cell phone towers on health are not certain, but cell phone companies are doing whatever they can to get as many towers out there as possible. Most towers are fairly obvious, but recently they are being disguised as trees, hidden in flag poles, and even placed neatly inside church steeples. Professor Christopher Busby, who sits on the European Committee on Radiation Risks, told RT yesterday that the reactors at Fukushima are a raging nuclear inferno and he believes at least one of the reactors is now outside its containment structure and emitting vast amounts of radiation into the atmosphere. A renowned nuclear activist has said the crisis at Japan’s Fukushima nuclear complex brought on by a 9.0-magnitude earthquake and resultant tsunami March 11 is much worse than the atomic disaster at the Chernobyl plant in the former Soviet Union in 1986. Dr. Helen Caldicott, at a March 18 Montreal press conference where she talked about the dangers of atomic war, discussed a wide range of nuclear-related issues she says are having profound effects on Europe, the U.S. and Japan – just a week after the quake crippled at least two of the site’s six nuclear reactors, which resulted in the release of radioactive materials. “Fukushima’s epic calamity continues to pose a major threat to the Japanese population (and) the rest of our planet.” Massive amounts of radiation keep leaking. “The magnitude of Fukushima’s radiation is now off the scale,” but its amount is deliberately suppressed – from up to six, not one, reactors. The New York Times and other mass media publications have been publishing articles that downplay the dangers of radioactive fallout from nuclear disasters like the Fukushima and Chernobyl disasters. And the Environmental Protection Agency has now stopped testing air, water, and milk samples for radiation despite the continuing release of radioactive materials into the environment from Japan. Workers at the Grand Gulf Nuclear Plant in Port Gibson, Miss., last Thursday released a large amount of radioactive tritium directly into the Mississippi River, according to the US Nuclear Regulatory Commission (NRC), and experts are currently trying to sort out the situation. An investigation is currently underway to determine why the tritium was even present in standing water found in an abandoned unit of the plant, as well as how much of this dangerous nuclear byproduct ended up getting dumped into the river. Many also want to know why workers released the toxic tritium before conducting proper tests. The US Environmental Protection Agency (EPA) announced yesterday that it is ceasing its special monitoring protocols in the US for radiation from the Fukushima Daiichi nuclear disaster in Japan, despite the fact that no real progress at the plant has been made, and threats to the US are persistent. At the same time as the EPA announcement, foreign reports also indicate that levels of radiation in Pacific waters near the Fukushima plant are now up to 1,000 times normal levels, with no real indication of where this radioactive water is flowing. Based on the accumulation of information from multiple sources, it is now clear that the true scope of the Fukushima disaster has been greatly downplayed by both the Japanese and U.S. governments. NaturalNews is now urging its readers to begin taking regular, safe doses of three things: Natural iodine sources (seaweed or otherwise), bentonite clay (for internal use) and zeolites (any brand). Below is the static map based on real time tabulations of the Norwegian Institute of Air Research pertaining to potential releases of radiation from the Fukushima plant. And then, right there on the chart, the very next line was a huge eye-opener, because it said: • 20,000 mSv Highly targeted dose used in cancer radiotherapy Cancer radiotherapy dose is fatal? Okay, so wait a minute. A dose of 10,000 is fatal, yet the cancer industry uses twice that dose to “treat” cancer? I knew cancer radiation treatments were barbaric, but I never knew they were twice the amount considered absolutely fatal. Thanks to an announcement by TEPCO, we now have a “target date” for addressing the radiation leaks from Fukushima. Believe it or not, TEPCO now says it plans to “reduce” the radiation leaking within three months. Notice that there is no admitted goal of “ending” the radiation within three months; just reducing it. So a drop in radiation of one percent would qualify as meeting this goal. The Fukushima Daiichi nuclear disaster has sparked an uprising against nuclear energy production due to concerns about its safety. Recently, 45 groups and individuals from across the US banded together to ask that the US Nuclear Regulatory Commission (NRC) cease all licensing for 21 pending nuclear reactor projects in 15 US states, and establish an independent commission to conduct an updated safety analysis of nuclear energy production in light of the ongoing meltdown taking place in Japan. What does radiation do to us? It burns the cells, kind of like burning down a house. It is well known that radiation burns our cells by creating too much free radical damage. Now of course this is like talking Greek to medical officials and professors because if they knew this they would be on the bullhorn telling the public what to do to minimize free radical damage. The radiation risk from Fukushima is “no longer negligable,” says CRIIRAD, the French research authority on radioactivity. It is now warning expectant mothers and young children to avoid drinking milk or rainwater. They should also avoid certain types of vegetables and cheese due to the dangerously high levels of radiation they may contain thanks to the radioactive fallout spreading across the globe. New EPA milk samples in Hawaii show radiation in milk at 800% above limits for C-134, 633% above limits for C-137 and 600% above EPA maximum for I-131 for a total of 2033%, or 20.33 times, above the federal drinking water limits. In Japan today we are witnessing a noble people being put to the test. In fact the entire world, with all its peoples and governments, are going to be tested against the sheer power of nuclear contamination that knows little of time and space. Radiation moves rather freely through space and some forms of it stay around for so long we might as well say forever. An intrepid Japanese duo has decided to do the reverse Fukushima commute and in a stunning filmed expose, drives through cracked roads, herds of animals in city streets and ghost towns to measure the radiation from 30 km out to 1.5 km away from Fukushima, where it hits 112 microsieverts, or roughly 350 times normal radiation. But don’t worry. Everything is still under the recently updgraded (twice) legal limit…. for those clad in lead armor. Recklessly promoting nuclear proliferation, America’s NRC is notorious for coverup and denial of its harmful effects. As a result, their rare admission virtually confirms a full core meltdown in one or more reactors, meaning vast amounts of radiation are being uncontrollably released into the atmosphere, water and soil, spreading over a vast area. It’s the ultimate nightmare scenario now unfolding, but don’t expect major media reports or government officials to explain. Virtually all the numbers you’re seeing about the radioactivity coming out of Fukushima are based on iodine-131 which only has a half-life of 8 days, not the far more dangerous cesium-137 which has a half-life of 30 years. So while the mainstream media reports that “radiation levels are falling rapidly” from the 7.5 million times reading taken a few days ago, what they’re not telling you is that the cesium-137 radioactivity will take 30 years just to fall by 50 percent. The mass dumping of highly radioactive water (measured at 7.5 million times the normal allowed levels) into the Pacific Ocean is not just an environmental disaster; it’s also a violation of international law. The Convention on the Prevention of Marine Pollution by Dumping of Wastes and Other Matter, passed in 1972, forbids nations and companies from dumping toxic wastes into the ocean. The mass radioactive contamination of our planet is now under way thanks to the astonishing actions taking place at the Fukushima nuclear facility in Japan. As of last night, TEPCO announced it is releasing 10,000 tons of radioactive water directly into the Pacific Ocean. That 2.4 million gallons of planetary poison being dumped directly into the ocean. Governments and those involved in nuclear power claim that it is safe and it is the cleanest energy. Japan has proved that wrong. It shows one event can cause the pollution of the Earth in such a toxic way that the oceans are being destroyed as Japan dumps radioactive water into the ocean. The air and land is being made toxic not to be able to be used for thousands of year (plutonium) and officials are still saying it is the “cleanest and safest” form of creating energy? Tokyo Electric Power Co., the operator of the Fukushima Daiichi nuclear power station, said Monday that it plans to release water containing radioactive materials into the sea in a bid to help speed up work to bring the crippled complex under control. The total amount of water to be released will be 11,500 tons and the concentration of contaminants in the waste water is estimated at about 100 times the legal limit, which is deemed as a relatively low level, it said. The battle continued Monday to plug a crack at Japan’s Fukushima Daiichi nuclear power facility that’s been a conduit for highly radioactive water leaking into the Pacific Ocean, utility company officials said. The NYT has compiled a useful visual summary of the current assessment of the Fukushima radiation, distributed by either air, soil, water and food, compiled through the work of the International Atomic Energy Agency and others. The observable trade off is that while the impact of inland radiation has so far been muted courtesy of favorable wind direction and modest rainfall, the actual concentration of radioactivity in the sea and groundwater is rising at an exponential pace. How long before conventional wisdom realizes that radiation tens of thousands of times above normal contaminating the sea is very bad, while one day of northeastern winds will set off every seismic counter in Tokyo? Despite countless reassurances that no harmful levels of radiation from the Japan nuclear fallout would hit the US from the EPA, the University of Berkley in California is now reporting that rainwater in San Francisco water has now been detected at levels 18,100% above federal drinking water standards. Nuclear engineers at UC Berkeley reported Wednesday they are detecting “extremely small” levels of radiation from the stricken Fukushima power plant in Japan, but the levels barely reach the limits of detection by their highly sophisticated monitoring equipment, they said. New research presented at the 36th annual meeting of the Society of Interventional Radiology in Chicago, Ill., has revealed the incredible power of antioxidants to protect the body against the damaging effects of radiation. Researchers from the University of Toronto, Ontario, Can., department of medical imaging found that patients who took an antioxidant blend prior to receiving medical radiation scans experienced significantly less DNA damage than others. The Environmental Protection Agency and the Food and Drug Administration say that very low levels of radiation have turned up in a sample of milk from Washington state. But federal officials say consumers should not worry. The FDA said such findings are to be expected in the coming days because of the nuclear crisis in Japan, and that the levels are expected to drop relatively quickly. High radiation has been detected at a village 40 kilometer from the Fukushima plant, according to the IAEA. Japan has encouraged evacuations only within a 20 kilometer radius. The finding will increase pressure on the government to extend the zone. The battle to save the Fukushima nuclear power plant now appears lost as the radioactive core from Reactor No. 2 has melted through the containment vessel and dropped into the concrete basement of the reactor structure. This is “raising fears of a major release of radiation at the site,” reports The Guardian, which broke the story (http://www.guardian.co.uk/world/201&#8230;). A former General Electric nuclear expert told The Guardian that Japan appears to have “lost the race” to save the reactor. Initial March 27 Tokyo Electric (TEPCO) reports detected Fukushima Daiichi Unit 2 radioactive water readings at ten million times normal levels. This measure was 1,000 times above water readings in Units 1 and 3. Emissions happen during nuclear fission. Tokyo University Professor Naoto Sekimura said the leak came from Unit 2’s damaged suppression chamber, designed to contain radioactive substance overflows. French Institute for Radiological Protection and Nuclear Safety’s Olivier Isnard believes high readings are “proof that the reactor core (at least) partially melted.” Others suggest a likely full meltdown, covered up and downplayed. Several nuclear power plants in the southeastern US have begun to detect low levels of radioactive iodine-131 in the air, which is the same type of radiation now being found all over the place as a result of the mega-earthquake and tsunami that struck the Fukushima Daiichi power plant in Japan on March 11, 2011. Reuters has indicated that power plants in both North and South Carolina, as well as one in Florida, have all detected what they say are “low levels” of the non-native radioactive substance. The Fukushima crisis continues to worsen by the day, with nuclear experts around the world finally realizing and admitting we’ve all been lied to. “I think maybe the situation is much more serious than we were led to believe,” said Najmedin Meshkati of the University of Southern California, in a Reuters report (http://www.reuters.com/article/2011&#8230;). That same article revealed that recent radiation readings at Fukushima show “contamination 100,000 times normal in water at reactor No. 2 and 1,850 times normal in the nearby sea.” Massachusetts rainwater has also been found to be contaminated with low levels of radiation from Fukushima, indicating just how widespread the radioactive fallout has become. It’s not just the West Coast of North America that’s vulnerable, in other words: even the East Coast could receive dangerous levels of fallout if Fukushima suffers a larger release of radioactive material into the air. The latest news out of Fukushima confirms fears that irradiated water containment at the radioactive plant has been complete breached, after Radioactive iodine-131 at a concentration 1,250.8 times the legal limit was detected Friday morning in a seawater sample taken around 330 meters south of the plant, near the drainage outlets of the four troubled reactors, the government’s Nuclear and Industrial Safety Agency said Saturday. If you listen purely to what Japanese authorities and officials at the Fukushima Daiichi nuclear power plant are saying concerning the unfolding nuclear meltdown situation, you might come away thinking that everything is just fine and under control. But reports continue to flood in that seem to say otherwise, suggesting that conditions at the plant are far from remedied. The darkness is broken only by the flashing torchlight of the heroes who stayed behind. These first images of inside the stricken Fukushima Dai-Ichi power plant reveal the terrifying conditions under which the brave men work to save their nation from full nuclear meltdown. The Fukushima Fifty – an anonymous band of lower and mid-level managers – have battled around the clock to cool overheating reactors and spent fuel rods since the disaster on March 11. According to Asahi Shimbun which is quoting the Japan NRC, the Fukushima event has just surpassed Three Mile Island in terms of seriousness, and has been upgraded from Level 5 “Accident with Wider Consequences” to Level 6 “Serious Accident.” Only Chernobyl is a Level 7 event. We believe Fukushima should get there within 2 weeks as ever more of the current devastation becomes public. Of course, all of this is a paper-pushing formality. What isn’t, are people who may be developing serious diseases as the government continues to misrepresent the severity of the situation. Not an hour passes without something material developing in Fukushima. Just out from NHK: all four broken reactors are now smoking. While 2, 3 and 4 have all issued smoke or steam at some point in the past, it is now Reactor 1’s turn. From NHK: “An NHK helicopter crew has confirmed what appears to be steam rising from No. 1, 2, 3 and 4 reactor buildings at the troubled Fukushima Daiichi nuclear power plant. This is the first time that steam has been seen coming out of the No.1 reactor. The helicopter crew was filming from a location more than 30 kilometers from the plant shortly before 7:00 AM on Thursday.” It was not all bad news: “The Tokyo Electric Power Company says that black smoke seen rising from the No.3 reactor building on Wednesday was no longer visible as of 6:00 AM Thursday.” It is unclear if the radiation level had dropped enough to where workers could resume their attempt to reactive the cooling stations at Fukushima. Tokyo authorities said city tap water may be unsafe for infants while Japan’s government sought to assure people that radiation levels detected in the food chain following a nuclear accident don’t pose a health threat. Radioactive iodine levels taken yesterday at a treatment facility in Katsushika ward were double the recommended limit for babies, a city official said in a televised briefing today. The water would pose a health risk if drunk over the long-term, such as a year, he said. Tokyo’s population is estimated to be about 13 million people. After repeatedly refusing to publicly release safety reports for its airport X-ray machines and naked body scanners — even after lawmakers ordered their release — the US Transportation Security Administration (TSA) now says that the same reports are flawed anyway (http://www.naturalnews.com/031321_n&#8230;). TSA insists data showing that some naked body scanners emit as much as ten times more radiation than normal is a “math error,” and that a retest will be required to obtain accurate results. Japan has been reporting for several days that much of the raw milk being produced in the Fukushima province is now radioactive. This raises today’s quiz question: If the FDA were operating in Japan, what would they do about this raw, radioactive milk? Answer: They would seize it because it’s RAW, not because it’s radioactive. The status of the Fukushima Daiichi nuclear plant’s Unit 4 reactor is one of the most critical aspects in determining the severity of the impending nuclear meltdown. After all, the most recent temperature readings available showed that the rods there were three times hotter than they should be, which was far worse than the other reactors at the time. And yet for several days, basic information like whether or not there is actually water left in Unit 4’s cooling pool, or what the current temperature is of the spent fuel rods there, is no longer being supplied and reported, at least not accurately. weeping The boss of the company behind the devastated Japanese nuclear reactor today broke down in tears – as his country finally acknowledged the radiation spewing from the over-heating reactors and fuel rods was enough to kill some citizens. In a truly incredible example of the complete disregard for the health and safety of the American people, President Obama today told Americans that they should NOT prepare for radiation from the possible meltdown of the Fukushima nuclear power plant in Japan. His exact quote: “The Centers for Disease Control and Prevention and public health experts do not recommend people in the U.S. take precautionary measures beyond staying informed.” In other words, Americans should do nothing other than listen to their government. Don’t buy potassium iodide pills (even though the U.S. Surgeon General has already urged people to do so), don’t fuel up your automobiles in case you need to evacuate California, don’t store some extra food and water… basically, don’t worry! There’s no problem! Obama says so! The devastating earthquake and tsunami in Japan has led to fears of nuclear destruction and an increasing talk about iodine. It is important to understand that not all forms of iodine are the same, and different types of iodine will concentrate in different tissues and glands within the body. The protocol: Iodine – Glutathione – Natural Chelation – Clay – Baking Soda. On Sunday, when I first released this protocol I said that it is too early to call everyone in North America to prepare for a radiation cloud streaming down radioactive particles from the accident in Japan. According to the media and government, America is not at risk due to radioactive fallout from the recent Japanese nuclear accidents and that is still officially the case. The New York Times notes: A United Nations forecast of the possible movement of the radioactive plume coming from crippled Japanese reactors shows it churning across the Pacific and touching the Aleutian Islands on Thursday before hitting Southern California late Friday. How much of a threat is the nuclear crisis in Japan? That question is on the minds of millions of people around the globe tonight. Unfortunately, the Japanese government and the mainstream media have both been doing their best to downplay this crisis. Even though there have been massive explosions at the Fukushima Dai-ichi nuclear facility, authorities in Japan have still been very stingy with information and they keep insisting that the situation is under control. But the situation is not under control. In fact, it just seems to get worse with each passing day. Radiation levels are now incredibly high at the Fukushima Dai-ichi complex and the radiation cloud is starting to spread. Radiation levels in Tokyo are already 10 times above normal levels, and there are reports in the international media that some people have begun to flee the city. It is imperative that the Japanese government tell the truth about what is going on because this could potentially affect the health of millions of people. There are over 12 million people in the city of Tokyo alone. If this nuclear crisis continues to get worse it could potentially end up killing more Japanese than the tsunami just did. Radiation produces free-radicals (“inflammatory molecules”) that damage cells that make up tissues such as organs, glands, muscles, and bones. Besides causing the cells to age more quickly they also become distorted, or mutated, creating cancers such as leukemia, anemia, birth defects, and other diseases. Sulfur has a long history of use as an antidote for acute exposure to radioactive material. DMSO is the classical sulfur compound. A Japanese study showed that even low concentrations of DMSO had radio-protective effects through the facilitation of DNA double-strand break repair, providing protection against radiation damage at all cellular levels in the whole body. In the aftermath of Japan’s nuclear catastrophe and the fear that winds could blow radiation into the west coast of North America, there has been a sudden rush on potassium iodide, which helps protect your glandular system from radiation poisoning if you’re exposed. The Japanese government is handing out this supplement in huge quantities to the survivors north of Tokyo, and here at NaturalNews, we’ve received a flurry of requests from people wanting to know where they can find available supplies of potassium iodide. Germany and Switzerland said Monday that they would be the first industrialized nations to freeze development of nuclear power facilities while they reassess safety procedures, in the wake of Japan’s ongoing nuclear crisis following last week’s devastating earthquake. The term meltdown is being used often. But what exactly would a meltdown in one of the Japanese nuclear power plants entail? The following is a simplistic description I found at a blog called Modern Survival. It gives a step by step of the process, with the end result being a catastrophic release of radiation into the atmosphere. The conflicting reports coming out of Japan over the last 24 hours point to the very likely possibility of a massive Japanese government cover-up where government officials are telling the public everything is fine while desperately pumping sea water into the reactor cores to prevent them from going Chernobyl. Japanese authorities have confirmed there was an explosion at the Fukushima No. 1 nuclear power plant Saturday afternoon but said it did not occur at its troubled No. 1 reactor, brushing off concerns that the quake-triggered problem could develop into a catastrophe. Chief Cabinet secretary Yukio Edano told an urgent press conference that the operator, Tokyo Electric Power Co., has confirmed there is no damage to the steel container housing the reactor, although the 3:36 p.m. explosion resulted in the roof and the walls of the building housing the reactor’s container being blown away. The top government spokesman said TEPCO has begun new cooling operations to fill the reactor with sea water and pour in boric acid to prevent an occurrence of criticality, noting it may take several hours to inject water into the reactor. “If they can’t restore power to the plant (and cool the reactor), then there’s the possibility of some sort of core meltdown”. An alarming statement made by James Acton, a physicist who examined Japan’s Kashiwazaki nuclear plant after a 2007 earthquake, who told CNN that Japanese authorities are in race to cool down the Fukushima reactor. Reported from abc NEWS, Scientists said that even though the reactor had stopped producing energy, its fuel continues to generate heat and needs steady levels of coolant to prevent it from overheating and triggering a dangerous cascade of events. “Given the large quantity of irradiated nuclear fuel in the pool, the radioactivity release could be worse than the Chernobyl nuclear reactor catastrophe of 25 years ago.” said Kevin Kamps, a nuclear waste specialist. Fukushima I (there are two plant locations) is one of the 25 largest nuclear power stations in the world. Watch now for another million-to-one shot of the second atomic power plant “going super-Chernobyl” on the nation that sided with Hitler during World War II and which pinned blame on Jewish Bankers” for Japan’s economic meltdown of the 1990s. The Port City of Fukushima, surrounded by dormant volcanoes, and a modern reactor with all of the best safeguards has, most improbably, is in danger of breaking down following a tailor-made super-quake and possible international sabotage of safety systems. Over 50,000 of the living have been forced to evacuate — but with major radioactive contamination there will be no place to go. This guide ‘When An ill Wind Blows From Afar! (Like from Japan Fukushima reactor)’ deals specifically with radioactive fallout that originated from afar, like a Chernobyl in the past, or Iran in the future that’s had its nuclear facilities bombed, releasing radioactive contamination into the atmosphere, or a North Korea gone mad, etc. This guide provides panic dispelling knowledge so people downwind can more promptly initiate appropriate protective actions, as required. This is the third in the series that begins with The Good News About Nuclear Destruction! that debunks the myths of nuclear un-survivability and What To Do If A Nuclear Disaster Is Imminent! that details the practical methods for American families to protect themselves from nuclear explosion(s) and fallout originating here. A nuclear reactor in the Fukushima Dai-Ichi power station about 220 kilometers (140 miles) north of Tokyo may be starting to melt down after Japan’s biggest earthquake on record hit the area yesterday. Fuel rods at the No. 1 reactor at the plant run by Tokyo Electric Power Co. may be melting after radioactive Cesium material left by atomic fission was detected near the site, Nuclear and Industrial Safety Agency, spokesman Yuji Kakizaki said by phone today. “If the fuel rods are melting and this continues, a reactor meltdown is possible,” Kakizaki said. A meltdown refers to a heat buildup in the core of such an intensity it melts the floor of the reactor containment housing. Japan declared states of emergency for five nuclear reactors at two power plants after the units lost cooling ability in the aftermath of Friday’s powerful earthquake. Thousands of residents were evacuated as workers struggled to get the reactors under control to prevent meltdowns. Operators at the Fukushima Daiichi plant’s Unit 1 scrambled ferociously to tamp down heat and pressure inside the reactor after the 8.9 magnitude quake and the tsunami that followed cut off electricity to the site and disabled emergency generators, knocking out the main cooling system. Some 3,000 people within two miles (three kilometers) of the plant were urged to leave their homes, but the evacuation zone was more than tripled to 6.2 miles (10 kilometers) after authorities detected eight times the normal radiation levels outside the facility and 1,000 times normal inside Unit 1’s control room. In my experience, it’s not often that pro-mammogram literature or textbooks tell the truth about the limitations of mammography so imagine my surprise when I came across this section in the 1,100 page textbook I’m studying called Breast Imaging by Dr. Daniel B. Kopans. “Because screening does not detect all cancers and does not detect all cancers sufficiently early to permit cure, screening should not be thought of as a method to reassure someone she does not have cancer. Emphasis was added by the book’s author. Does using a cell phone have an effect on the brain? According to a 2011 study titled “Effects of Cell Phone Radiofrequency Signal Exposure on Brain Glucose Metabolism,” the answer is absolutely. A groundbreaking study published today by one of the world’s leading neuroscientists challenges the longstanding conviction that radiation emitted from cellphones is too weak to have an effect on the brain. You can think of cellphone saturation as one giant, uncontrolled human experiment. There are now 293 million wireless connections in use in the United States, according to the trade group CTIA-The Wireless Association. And Americans log a staggering 2.26 trillion minutes yakking on those mobile devices every year—all at a time when the biological effects of cellphones remain controversial and the research on those effects often of dubious quality. Radiation from a mobile phone call can make brain regions near the device burn more energy, according to a new study. Cellphones emit ultra-high-frequency radio waves during calls and data transfers, and some researchers have suspected this radiation — albeit inconclusively — of being linked to long-term health risks like brain cancer. The new brain-scan-based work, to be published Feb. 23 in the Journal of the American Medical Association, shows radiation emitted from a cellphone’s antenna during a call makes nearby brain tissue use 7 percent more energy. The Transportation Security Administration has told members of Congress that more than 15 million passengers received full-body scans at airports without any malfunctions that put travelers at risk of an excessive radiation dose. Despite the reassurance, however, the TSA has yet to release radiation inspection reports for its X-ray equipment — two months after lawmakers called for them to be made public following USA TODAY’s requests to review the reports. Scientists with the University of California at San Francisco were so worried that they wrote a letter to the White House Office of Science and Technology in April, 2010 raising “a number of red flags” on the scanners’ safety. The “red flags” raised by these scientists are absolutely shocking and clearly expose the propaganda being put out by the TSA that these machines are safe. Is something burning, or are you just computing again? New research published in the medial journal Fertility and Sterility (Nov 2010) reveals that laptop computers can roast a man’s testicles to the point where sperm production (and quality) starts to drop. America’s hidden history is ugly and disturbing. No nation ever matched it. To Iraq alone, over the past two decades, it includes ongoing genocide, destruction, terror, occupation, and contamination – a horrendous combination of crimes, unmentioned in Western discourse. CT scans yield higher-resolution images than regular medical X-rays. Unfortunately, they also expose the patient to hundreds and sometimes thousands of times the amount of radiation. The routine use of CT scans has vastly increased. In 1980, there were roughly 3 million CT scans performed. By 2007, that number had increased to 70 million. CT scans are now being promoted to healthy people – even whole body CT scans. My, you look glowing today! Cancer patients who receive radiation of their thyroid glands by being given radioactive iodine are highly radioactive for up to a week following their release from the hospital — and they end up irradiating not just hospital rooms but also other patients, friends and family members. Radiation levels are so high in these people that they have set off radiation alarms designed to detect terrorist threats, says a congressional report. Magda Havas demonstrates how WiFi connects your laptop, iPhone and iPad to the internet via microwave radiation. You will also learn how WiFi base stations, portable phones and baby monitors constantly radiate microwave radiation. The Swiss Government feels that all of these devices have the potential to do great harm if used incorrectly and warn their citizens. Mammograms deliver overwhelmingly more false positive results than true positives in women under the age of 40, according to a new study conducted by researchers from the University of North Carolina-Chapel Hill and published in the Journal of the National Cancer Institute. In a false positive result, a mammogram detects signs of a tumor that turns out to be non-cancerous or otherwise not dangerous to a woman’s health. Mobile phone firms have been accused of concealing warnings about the health risks of using their handsets. A warning that Apple’s popular iPhone should be kept at least 15mm away from the body is buried deep inside the manual. BlackBerry goes even further, saying customers should use their devices hands-free or keep them an inch from the body ‘including the abdomen of pregnant women and the lower abdomen of teenagers’. Again, this advice is hidden in the instruction booklet. A tiny amount (a milligram) of this radioactive poison quick marches up your smelling nerves right into your brain and keeps firing 1.2 Million bullets a day – forever. That’s a bunch. 850 Rounds a Minute The radioactive 850 rounds a minute automatic weapon is about as big as the period at the end of this sentence, never needs reloading and never jams. It’s a perfect killing machine for brain cells and other cells. The range is about 20 cells, after that there is what the famous British physicist Dr. Chris Busby calls the “bystander effect.” He discovered it, he gets to name it. As the privacy controversy around full-body security scans begins to simmer, it’s worth noting that courthouses and airport security checkpoints aren’t the only places where backscatter x-ray vision is being deployed. The same technology, capable of seeing through clothes and walls, has also been rolling out on U.S. streets. The proper interpretation of this study is that the link between heavy cell phone use and brain tumors is confirmed, yet low level usage is actually beneficial. We need to determine what low level usage really means, but so far so good. The research on depleted uranium comes out of French researchers that examined the manner DNA is affected by enriched and depleted uranium. The metal or chemical effect it seems is the more important in depleted uranium exposure. Questions remain on the problem of inhalation and ingestion of depleted uranium in the sands of Saudi/Iraq that has a high silica content and the health effects that would be seen. Questions also remain on syngestic health effects when you add in other toxic exposures experienced by Gulf War Veterans. A new report released by the National Council on Radiation Protection and Measurement reveals that Americans’ exposure to radiation has increased more than 600 percent over the last three decades. Most of that increase has come from patients’ exposure to radiation through medical imaging scans such as CT scans and mammograms. The compelling new video, Everything Nuclear, produced by David Weisman and the Alliance for Nuclear Responsibility, is packed with… authoritative interviews of experts on the myriad problems of nuclear power. Featured here is a transcription of the highly informative speakers juxtaposed against industry promotional videos and government propaganda videos. The outback of the Hanford Nuclear Reservation in eastern Washington State is called the T-Farm. It’s a rolling expanse of high desert sloping toward the last untamed reaches of the Columbia River. The “T” stands for tanks—huge single-hulled containers buried some fifty feet beneath basalt volcanic rock and sand holding, the lethal detritus of Hanford’s fifty-year run as the nation’s H-bomb factory. Those tanks had an expected lifespan of thirty-five years; the radioactive gumbo inside them has a half-life of 250,000 years. Dozens of those tanks have now started to corrode and leak, releasing the most toxic material on earth—plutonium and uranium-contaminated sludge and liquid—on an inexorable path toward the Columbia River, the world’s most productive salmon fishery and the source of irrigation water for the farms and orchards of the Inland Empire, centered on Spokane in eastern Washington. In 1979, depleted uranium (DU) particles escaped from the National Lead Industries factory near Albany, N.Y.,which was manufacturing DU weapons for the U.S military. The particles traveled 26 miles and were discovered in a laboratory filter by Dr. Leonard Dietz, a nuclear physicist. This discovery led to a shut down of the factory in 1980, for releasing morethan 0.85 pounds of DU dust into the atmosphere every month, and involved a cleanup of contaminated properties costing over 100 million dollars. Imagine a far worse scenario. Terrorists acquire a million pounds of the deadly dust and scatter it in populated areas throughout the U.S. Hundreds of children report symptoms. Many acquire cancer and leukemia, suffering an early and painful death. Huge increases in severe birth defects are reported. Oncologists are overwhelmed. Soccer fields, sand lots and parks, traditional play areas for kids, are no longer safe. People lose their most basic freedom, the ability to go outside and safely breathe. Sounds worse than 9/11? Welcome to Iraq and Afghanistan. Researchers at Pennsylvania State University’s medical center in Hershey have stumbled onto what may be an effective home remedy to prevent serious radioactive contamination of the thyroid gland from iodine-131 emitted in the event of a major nuclear plant mishap. They swab the skin with a tincture of iodine. A white crystalline compound used as a source of iodine to treat thyrotoxic crisis and to prevent thyroid cancer in the event of overexposure to nuclear radiation. It is also used as an expectorant and antifungal. in regions downwind of a serious nuclear accident to block the thyroid’s uptake of radioactive iodine. Tincture of iodine keeps radiation away. By illegally using thousands of tons of nuclear waste in the form of armor piercing rounds, referred to as “depleted uranium” or “DU”, in the invasion of Iraq, the United States and Britain have gravely endangered not only the Iraqis and their own troops, but the entire world. In the first invasion, at least 320 tons of DU were exploded into Iraq, at least 1500 tons were blasted in the second illegal invasion. Weapons of Mass Destruction Found In Iraq!